Malleable Cast IronGalavanised Iron Pipe Fittings for Gas are ISI confirming to IS:1879:2010, Size Range 1/4" to 6" Standard'sas per Indian Standard, British and American Standard. 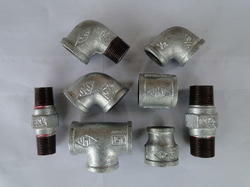 All the malleable cast iron pipe fittings are as per IS : 1879:2010. Looking for G.I.Pipe Fittings for Gas Applications ?